If there's one thing I like, it's a cookbook. Especially ones for baking. I love to bake. Even with just Gerry and I here till Erika is home from school in May, I will bake and freeze. 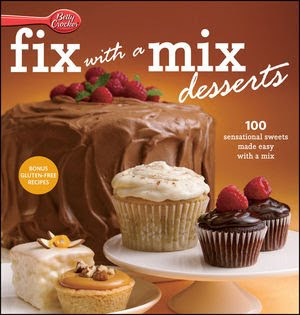 Betty Crocker has this great cookbook called: "Fix With a Mix Desserts". This book is exciting because it has a color picture for every recipe in the book. It's always nice to see what your finished creation will look like, plus they have the mix that you will need to use highlighted on every recipe. So perhaps you can use up those mixes you bought and are sitting in your pantry. I myself can't wait to start baking! Wiley would love to give one of these books away to one lucky winner from Canada, in a random draw to be held by Random.org on March 28,2011. Tell me if you bake more cookies or cakes? I make cakes all the time. I bake more cookies at the moment (but prefer baking brownies). I love both but cakes are my fave!! I bake more cookies than cakes. I bake cookies more often. I don't bake but hoping that this will change once I win this book! bla20(at)sfu(dot)ca - follow you on twitter; tweeted this giveaway; subscribe to your emails. Love baking, and Betty Crocker books are my mainstay! Depends on the time of the year (cookies are profuse around holidays), but overall, I bake more cakes than cookies (when you count cup'cakes' too!). REally enjoy the fluffy icings you put on cakes/cupcakes, and can get just as creative with their decorations as with cookies! twitter follower of yours as Days1st. Definitely a loyal follower/reader of your blog via email! Always look forward to receiving your emails and reading what you have to say! Thank you for all the time and effort your put into your blogs and your giveaways! I really appreciate it. I bake more cookies then cakes!